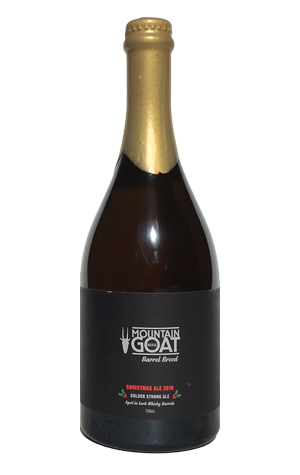 As with all Barrel Breeds to date, the beer was aged in Lark Distillery barrels. Unlike last year's Christmas Ale, which was based upon darker, heavier Belgian quadrupels, this time around the Goats stayed in Belgium but opted for a strong golden ale, one they reckon is "made for enjoying on a glorious summer's day" – even at close to 10 percent ABV. Based upon the "pleasant, bready character" of specialty Belgian Chateau pilsner malt, the key characteristics, as is often the case with Belgian beers, are those imparted by the yeast, in this case "spiced fruit aroma, reminiscent of pear with a hint of tropical fruit", we're told, with the brewers suggesting the oak adds a drying finish and roundness to the beer.